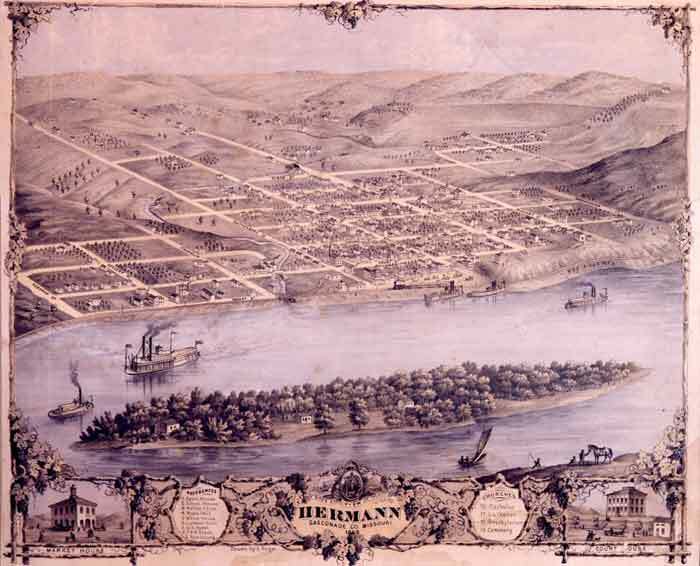 It is commonly believed that the Hermann area’s resemblance to the Rhine Valley prompted scouts from the German Settlement Society of Philadelphia to choose the site for a colony on the American frontier. Meanwhile, back in Philadelphia city planners were mapping out a grand new city, undeterred by their total ignorance of the actual terrain. On paper, Hermann was flat, with spacious market squares and sweeping boulevards. Thinking big, they made their city’s main street 10 feet wider than Philadelphia’s. When the first 17 settlers stepped off the last steamboat of the season into what one writer described as “a howling wilderness,” their starry-eyed idealism died on the spot. Some were furious to discover that the Hermann lots they had purchased back in Philadelphia were what today’s residents jokingly refer to as “vertical acreage.” The fact that the town survived at all is a testament to German determination and hard work. Making the best of a bad situation, the Germans took their cue from Mother Nature and planted vineyards on the rocky hillsides, where wild grapevines grew with tangled abandon. A decade later, steamboats brought St. Louis visitors to Hermann’s first Weinfest, where they enjoyed more than their share of sweet Catawba wine and marvelled at the grapevine-covered hills. By the turn of the century, Hermann’s winemakers had become wildly successful. Stone Hill Winery had grown to be the second largest winery in the country and was winning gold medals at World’s Fair competitions around the globe. The town’s numerous vintners were producing an incredible three million gallons of wine a year. 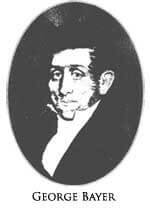 In its glory days Hermann was a rollicking river port with a tavern on every corner and the largest general store between St. Louis and Kansas City. The party ended with the one-two knockout punch of anti-German sentiment provoked by World War I and the Volstead Act of 1919. Prohibition sent Hermann reeling into the Great Depression a full decade before the rest of the country. The only silver lining was that economic ruin put the town into a time warp-there was simply no money to modernize the old buildings.